Our priests would like to help you celebrate what is good in your marriage! St. Michael utilizes Marriage Preparation and Enrichment tools through FOCCUS, Inc. Their Marriage Enrichment tool, REFOCCUS, is ideal for any "Step" in your journey to a joyful marriage. this tool allows you to spend invaluable formational time with your spouse and a priest, celebrating what is good and creating a p lan for a more joyful future. The REFOCCUS Inventory consists of a simple questionnaire and multiple sessions with one of our priests. If you are interested, please contact: Fr. Matt or 913-402-3900. Lent is a season o f reflection, repentance and reconciliation. We often hurt the ones closest to us. Our words, actions or indifference can affect our relationship with our spouses. Stations of the Cross for Married Couples invites you to reflect on the Passion of Christ in your relationship. This unique Stations of the Cross allow couples to experience the significance of our Lord’s Passion in your marriages. This first station is about hypocrisy, not living up to what we believe. Remember, Jesus was condemned to death for being what He was meant to be. We condemn ourselves when we cannot accept and believe in ourselves as good and loveable. God does not make junk. For all couples that they may refrain from making rash judgments about each other, let us pray. * * For the sensitivity to see each other&apos;s gifts and reflect Your goodness. Let us pray. R: We pray to the Lord. See above link to print the entire document. 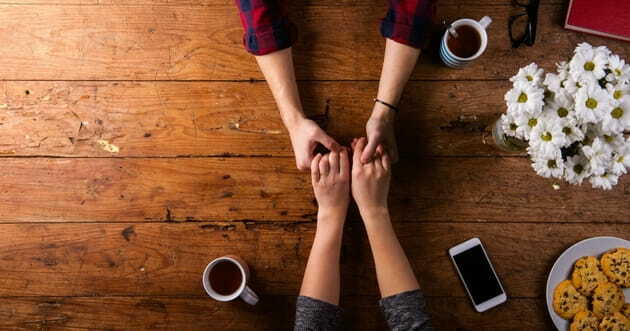 The Together for Life Online Email Newsletter aims to provide couples with tips and advice on living out their marital commitment through the challenges of married life. Each month couples will receive an email with links to various articles and marriage enrichment ideas focused on spirituality, communication, sexuality and intimacy, finances, and date ideas. These resources, taken from some of the most popular marriage experts and bloggers, will help couples overcome the challenges of married life and become happier and more in tune with each other’s needs, goals, and desires. The subscription is completely free and we won’t share your information with anyone. Date Night is a monthly event ( sponsored by the archdiocese&apos;s School of Love) for married couples held on the first Thursday evening of the month (typically on or around the Plaza). We start your date with a happy hour, appetizers (on us! ), and a brief talk on faith, marriage, family… You finish your date at home or out on the town. (We even send optional “kick-starter” questions from the night’s talk.) It’s a combination of low-key but classy, fun but important. Already a few hundred couples of all ages, from all parts of town, and from various degrees of the faith have attended… and so many keep coming back with great reviews. Date Night is Free?! Also, engaged couples are welcome. So are babies under 1. And there’s no RSVP! So it’s a easy, fun, and rewarding way to put prioritize what’s most important in your life! As a St. Michael parishioner, you have access to a wealth of resources through "BELOVED", including two options for Marriage Enrichment. For your SMA access code, in order to create an account, please contact your Pastoral Ministry Coordinator!